There is no denying that Twitter has had a huge impact on how marketers are thinking about using social media tools for marketing. One thing that is most interesting about it, however, is how the site has managed to avoid overcomplicating itself with more features. Twitter is simple, and it just works. Of course the one overused word that has been used recently to describe Twitter is that it is a "firehose" of information, shooting out at a speed and volume that has threatened to make it unusable for many people. So when I had a chance to try out Twitter's new Lists feature (which I had been looking forward to seeing for some time), I was not only surprised, but also excited about what this will mean for all of us who use the site. 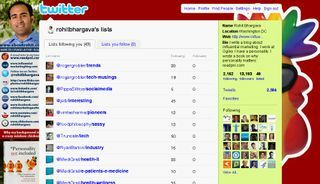 Here are just a few reasons why I think lists may revolutionize how you use Twitter. You can segment your firehose. The #1 criticism of Twitter is that if you follow thousands of people and see all their tweets appearing in one interface, it's tough to manage. Searches in third party tools like Hootsuite or Tweetdeck have made this more manageable, but those usually only work based on keywords, which is inefficient. What if I wanted to just see all the tweets from my colleagues at Ogilvy? That was tough to do. Now with lists, I can create my own group of colleagues and just reference that. Offers a more meaningful metric of influence. You'll notice if you have a Twitter account that in the spot where it used to just list the number of tweets you have done, it now shows how frequently you are "listed." This is a new metric of influence that sits somewhere between followers and retweets – but one that indicates how frequently other Twitter users who are creating their own lists are including you on their list. In short order, I imagine that number (along with retweets) will become more influential than having hundreds of thousands of robot followers when it comes to measuring influence on Twitter. Allows you to easily follow a trusted group of individuals. One of the biggest issues I have had in the past with Twitter is that it is difficult to follow a group of users all at once. Of course, you used to be able to use services like Tweepml to do this, but that was incomplete and the lists were often anonymously posted and so the data may not be as trustworthy. Now with Twitter Lists, you can create a list of all the attendees at a particular conference, for example, and with one click anyone can follow them. Lets any user of Twitter segment who they actually read. Up until now, the greatest compliment you could give someone who you follow and read on Twitter was to retweet something they posted. Now with Twitter Lists, you can add them to a list and not only make your own experience of reading content on Twitter better (see #1 on this list), but you can also send a subtle reminder to the person you are following that unlike the other thousands of accounts you might follow, their's is one you actually pay attention to. Gives brands an opportunity to aggregate multiple accounts. Many brands have multiple accounts – for example hotel brands that have a master account and then separate accounts for separate regional properties. This phenomenon was becoming more widespread, but now with Twitter Lists, brands can aggregate all their accounts together in a list – and best of all, if each Twitter account does this, the lists will show up on the sidebar linking anyone who sees one branded account to all the others. Clearly, I'm excited about what Twitter Lists has to offer for marketers. What do you think – is this a big deal for marketers or for anyone else?